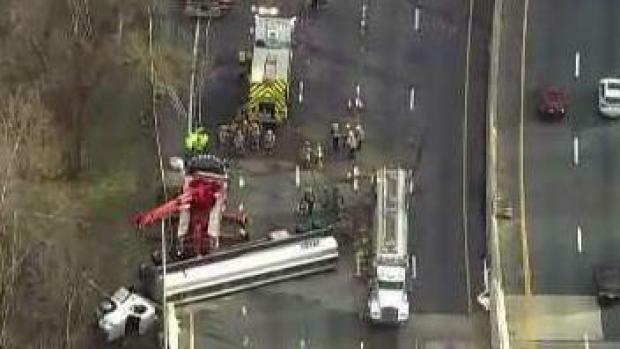 The tanker crash near the American Legion Bridge Thursday didn't just close lanes on the Beltway, it caused gridlock across the D.C. Metro area. 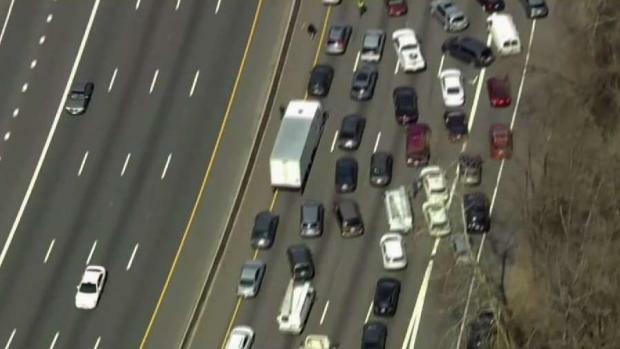 Social media posts showed traffic at a standstill in Georgetown, near the Pentagon and through Rock Creek Park. "It shows the fragility of our transportation system," said AAA Mid-Atlantic's John Townsend. 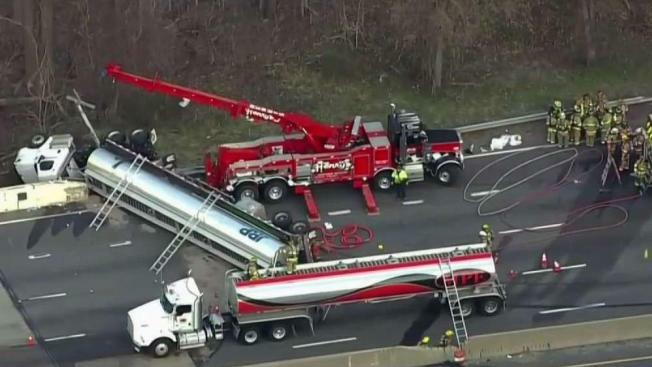 It took more than 13 hours to get the truck back on its wheels and off the bridge so that part of the Beltway could open about 3 a.m.
An overturned tanker on the Beltway caused a major ripple effect in the D.C. area. News4's Jackie Bensen reports. The closure has reopened the debate about building another bridge between Maryland and Virginia. "Everyone is thinking about it on a day where something terrible happens, but it's actually a problem every single day for everyday commuters," said Matt Letourneau, who serves on the Loudoun County Board of Supervisors. Letourneau has long argued for another bridge, but some counterparts across the bridge take a different view on fixing our dependency on major roads and bridges. "It's fragile and it's vulnerable and we need more redundancy," said Tom Hucker, from the Montgomery County Council. "And that doesn't mean more bigger roads. We need more transit options." Both men agree that being so dependent on what they call a fragile traffic system is a homeland security issue as well as a commuter problem. "We need the federal government to invest more in our highways," Tucker said. A huge multijurisdictional response was needed to clear an overturned tanker filled with 8,500 gallons of fuel off the Beltway. The crash left all Inner Loop lanes near the American Legion Bridge blocked. "I hope it's a wake-up call for the region," Letourneau said. In fall 2018, Loudoun County gave the OK for two new river crossing locations, News4 partner WTOP reported. But Letourneau told WTOP at the time that there was reluctance from some lawmakers, particularly in Montgomery County. AAA Townsend says regardless of what side of the bridge you're on, the region needs to come together. "There are a hundred incidents like this a month that could morph into something of this magnitude," he said. AAA estimates the crash cost the region $5-6 million in lost productivity. The driver received citations for reckless driving and faulty breaks.